Boston-based consulting firm Charles River Associates, with strong roots in forensic investigations and accounting, has supported some of the most prominent law firms in the world on major probes. Charles River Associates (CRA) was founded in 1965 and has a long history of assisting companies in cross-border investigations related to fraud, bribery and corruption, money laundering and accounting improprieties. The firm provides forensic accounting and big data analytics for its clients. CRA’s team is often called upon to present findings from its investigations to regulators and to provide expert witness testimony in related disputes. In Chicago, the vice president and leader of the forensic services practice, Kristofer Swanson, is an expert in anti-money laundering, fraud and financial forensics. He has held leading forensic roles at major professional services firms including PwC, Navigant and KPMG. Also in Chicago, vice president Bill Hardin has worked on hundreds of forensic matters related to data breaches and cyber security, as well as white-collar crime and Foreign Corrupt Practices Act investigations. Swanson and Hardin’s paths crossed both at the now-defunct auditor Arthur Andersen and at Navigant. Many of the names to know at the firm worked at Arthur Andersen in the late 1990s and early 2000s, before it went out of business following the Enron scandal. Both Swanson and Hardin joined CRA in 2015. CRA has a digital forensic lab which it established in 2016 to help it sift through and analyse complex data and digital evidence. In London, Paul Doxey is a senior consultant who has led large-scale investigations in Europe and Asia. Doxey also spent two years seconded at the Bank of England’s investigations unit and at the UK Financial Services Authority, now the Financial Conduct Authority. Vice president Colin Johnson, also in London, advises on investigations across the globe in several different languages. Vice president Peter Resnick, at the firm’s base in Boston, joined CRA in June 2017; he was previously a partner at Grant Thornton where he led its forensic and valuation services practice. Another Boston vice president, Andrew Obuchowski, has experience leading high-profile cybercrime and data breach investigations. CRA assisted The Ashcroft Law Firm in assessing Qatar’s anti-money laundering and counter-terrorist financing regime. CRA helped an international medical device company identify the extent of improper payments made to government officials at a subsidiary that led to the company’s self-disclosure of potential Foreign Corrupt Practices Act violations to US regulators. The firm assisted in analysing the company’s accounting system as well as various payments made across India. CRA also reviewed emails and assisted in on-site interviews. The firm was retained by a multinational provider of offshore contract drilling services to help in-house counsel in an investigation over allegations of improper payments and kickbacks. CRA assisted on interviews, analysing financial transactions and reviewing accounting records at the company’s facilities in India, Bahrain and Dubai. The investigation found millions of dollars of improper payments which led the company to fire one of its executives. CRA was retained by a global insurance company to investigate potential bribery and corruption issues in Mexico. A member of the firm’s forensic team played a leading role in managing the probe, including overseeing the collection of data in Mexico. The firm has also helped several major organisations navigate malware intrusions and data privacy breaches. CRA has also investigated False Claims Act matters. CRA has over 640 professionals located in nine countries around the world. Its forensic services practice has over 40 consultants in the US and Europe. The firm can claim several major law firms as clients including Winston & Strawn, Kirkland & Ellis, Jones Day, Taylor Wessing, Mayer Brown, Mischon de Reya, Vinson & Elkins, and Skadden Arps Slate Meagher & Flom. Companies that CRA has represented span the healthcare, financial services, manufacturing, telecommunications and technology fields. CRA has also been hired by government agencies. CRA was retained by a law firm on behalf of a communications company to assist in an investigation over allegations of improper revenue recognition, kickbacks and more. CRA worked on-site in Mexico to interview company personnel, analyse various transactions and provide a report to the company’s general counsel. CRA has also helped companies investigate the theft of trade secrets. They were retained by an international pharmaceutical company to help investigate an employee who took lucrative research information to a competing start-up in China. The data was returned and the company received a settlement. CRA was also retained by a global information services company to help it investigate whether former US and UK employees brought valuable trade secrets to a new competing company they created. The data was returned and a settlement was agreed. The firm was also retained by a global insurance sector company to investigate alleged fraud carried out in Spain. The firm assisted Hogan Lovells in this matter. We help clients and their counsel get to truth when independently responding to allegations of fraud, waste, abuse, misconduct and non-compliance. We are noted for deploying cross-trained teams of forensic professionals to assist our clients in gaining deeper insights and greater value more quickly. 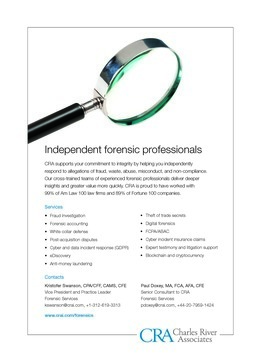 CRA’s forensic services team is comprised of CPAs; former law enforcement officers; CFEs; CAMs; CFFs; investigators; Big Four auditors; PhD economists; industry experts in healthcare, energy and financial services; information security experts; and computer forensics experts. We are often called upon to present findings from our investigations to regulators and to provide expert witness testimony in related disputes. The support we provide clients and their counsel encompasses three core areas: forensic accounting and investigations, cybercrime and data-breach investigations, and e-discovery and structured data. Charles River Associates is a leading global consulting firm that provides independent economic and financial analysis of litigation matters; delivers independent accounting and other forensic services; guides businesses through critical strategy and operational issues to become more profitable; and advises governments and regulatory agencies on the economic impact of policies and regulations. We are headquartered in Boston, US, with more than 650 professionals located in nine countries around the world and are able to respond nimbly to events on a global scale. For more information, please visit www.crai.com.